This recipe is a showstopper. Combination pancake and popover, it’s made in the oven and puffs up to impressive heights during baking. 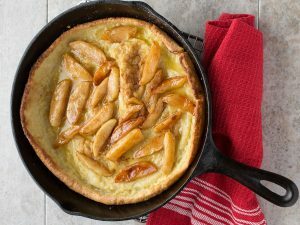 The sautéed apple topping is optional; if you aren’t in the mood for apples, a simple dusting of powdered sugar or a sprinkle of fresh berries finish the pancake perfectly. Place butter into 8-inch cast iron skillet. Place skillet in the oven to melt the butter. Whisk together eggs and milk in a medium bowl until smooth. Add flour and sugar. Whisk until smooth, about 1 minute. No lumps should remain. Remove skillet from the oven. Carefully rotate skillet to coat it with melted butter. Pour batter into hot skillet. Return the skillet to the oven. Cook the pancake for 20 to 25 minutes, or until the pancake is puffed in the center and golden brown along the edges. Prepare the Apple Topping, if using, while the Dutch baby bakes. Melt butter in a medium nonstick skillet over medium heat. Add the apple slices, sugar and cinnamon. Stir to combine. Reduce heat to low. Stir occasionally. Cook until apples are soft, about 20 minutes. If apples are ready before the pancake, turn off heat. Remove pancake from oven. Top with cooked apples. Serve immediately.